In continuation of its Droid Does advertising campaign from last month, Verizon in pursuance of anti Apple campaign, has launched yet another ad war against iPhone, which is totally Droid centric, but this time a little personal on Steve Jobs as well. Although the ad is Droid specific, it fails to express or tell any strength or specialty of Droid feature wise, and is rather totally focused on highlighting and targeting the weakness of iPhone. Shown below is a page printed in the recent edition of Sports Illustrated magazine with the following text. This is a world of “nope, “nuh-uh’”,” and “sorry, Charlie”. A world of smiling denial. Petty tyrannies that have made their way into our cell phones. Into the very way we choose to speak to another human being. There are dozens of doesn’ts. Doesn’t all customization. Doesn’t run multiple apps. Doesn’t allow you to swap out batteries. doesn’t allow open development. These arrogant little devices are barely worth more than the pocket link they rest upon. Because now there’s a phone so smart, so strong. So subservient to its user, it refuses to include “doesn’t” in its dictionary app. In a world of doesn’t. Droid Does. CNET has opined that Verizon this time has gone a bit too personal by expressing its feelings about the negotiations that they might have had with Apple to bring the iPhone to Verizon, and consequently attacking Steve Jobs himself for the role he might have played in these negotiations. "Petty tyrannies have made their way into our cell phones" is a sentence which by no means is directed towards iPhone, but to an individual. Similarly, using word like "arrogant" in the phrase, "these arrogant little devices", makes it no doubt a personal remark obviously against someone who may not be to their liking. Steve Jobs? Your guess! The way Verizon is spending its time and money in an effort to let down Apple and the iPhone through this ads war makes them look desperate to not have a phone like the iPhone. Sure they have got the two Droid phones but it is still too early to judge them as a success at this point of time. Apple on the other hand is cruising by selling iPhone’s like hot cakes. It will be interesting to see how Apple responds to these ads. Knowing how they do it on the PC front with “Get a Mac” ad campaign, you can expect them to come back hard at Verizon and Droid in their upcoming iPhone ads. Although I do think the Droid is overall better than the iPhone, I'm disappointed at the fact that Verizon and Motorola are promoting it through attacks at Apple, who, in turn, attacks Microsoft. Why can't Verizon, Motorola and Apple promote their own products? Weaklings. Apple started all of this negative advertising with it's attacks on Windows, so Apple gets no sympathy. But I don't think Apple has to worry about it's customers being lured over to Droid. On the other hand, AT&T certainly has something to worry about. Their reputation was already bad. Verizon is simply reinforcing what people already suspected/knew. Their service is perceived to be not as good as Verizons. The Verizon ads seem to be almost mean spirited which may backfire, but it'll be interesting to see how this whole thing shakes out. Apples PC ads do not personally attack. They are clever, whitty and fun. Droid ads represent the overall concept of the phone itself and Verizon's real personality – dark and evil. 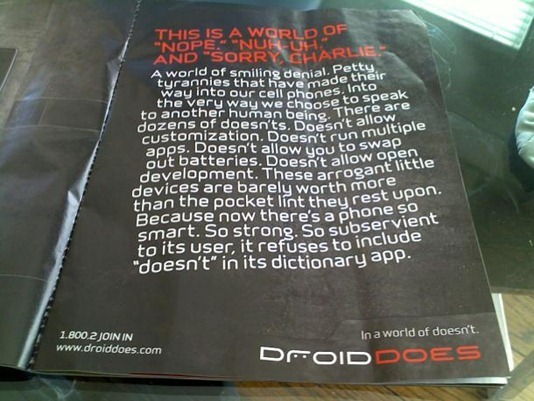 The misfit toys ad was funny, the new Droid ads just get too personal and mean spirited. open dev ? who cares …. battery change ? duh … the iphone doesn't guzzle power like the “droid does”. customization ? really ? does the common man really care about “customization”. Multiple apps is the only thing that they got going … which again contributes to the battery draining faster than you can say “droid does”. iphone is the way to go for overall use and intuitiveness … and more fun.. with all the apps. Droid is a phone that you'll probably see with the nerd crowd …safe in their pocket protector. I guess Verizon has discontinued selling any of its own arrogant little devices. Will they give me a refund on my RAZR? I agree. I owned the 3GS for six months and recently acquired the droid, and I must say I enjoy the droid much more. But it would be nice if the large companies would stop attacking each other. Enjoy droid over iphone????? LOL this must be while you have it plugged into the wall. Battery life is shi t, Only has 3 home screens, No word on Open development yet, camera feels outoffous instead of autofocus, keyboard is stiffer than Ron Jeremy, no multi touch support w/o 3rd party apps. Thats alot of major donts for a phone that supposedly does. Hey enjoy those flash web pages that you can pull up and why not pull up five at a time to drain that already crappy battery it comes with? I own an iphone 4 and it's not because i'm an apple fanboy but only because iphone was the best 3 years ago.. Android phones came along along and they are amazing.. i do believe Android will be on 90% of phones in 5 year span.. The only reason i'd prefer android over ios is the fact that it's an open source.. and open source is not about customization but rather freedom.. I can do whatever i want on my phone even rick it, who's to call me on that? no one.